Né en 1976 à Ciudad Real (Espagne), Fernando Villanueva étudie la composition au conservatoire Joaquín Turina à Madrid et se perfectionne auprès de compositeurs renommés. Il reçoit plusieurs commandes, notamment de l’Auditorium national de musique de Madrid. Ses pièces sont données en Espagne et en Europe par des ensembles comme l’ensemble Taller Sonoro, Court-Circuit, Proyecto Guerrero, l’ensemble Plural, et sont dirigées, entre autres, par Jean Deroyer et Beat Furrer. 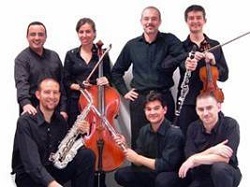 De 2007 à 2009, il suit les deux années du Cursus de composition et d'informatique musicale de l’Ircam ; son projet, Bukowski Madrigals, est créé le 13 juin 2009 par Donatienne Michel-Dansac et l’ensemble L’Instant Donné dans le cadre du festival Agora. Fernando Villanueva s’intéresse particulièrement aux nouvelles rhétoriques issues des nouvelles technologies ainsi qu’à la formalisation des divers aspects du discours musical. Il est professeur de composition au conservatoire de Ciudad Real. Francisco M.M. Cabeza de Vaca es compositor. Estudió grado superior en Composición en el Conservatorio Superior Rafael Orozco de Córdoba y en la actualidad cursa esa especialidad en el Conservatorio Superior de Música de Aragón con José María Sánchez-Verdú. Así mismo se ha formado en composición electroacústica con Alberto Bernal en el Aula de Músicas Experimentales de Madrid. Ha estrenado música instrumental y electroacústica en diversos festivales nacionales (Temporada CDMC-Auditorio 400 del MNCA Reina Sofía, ENSEMS Valencia, Festival de Música Española de Cádiz) e internacionales (Festival de Mérida en México, Festival de Orford en Canadá) Ha participado como compositor y/o intérprete en espectáculos escénicos, fundamentalmente de danza contemporánea, colaborando con coreógrafos como, entre otros, Michelle Man, Guillermo Weickert, Fernando Lima o María Cabeza de Vaca. Entre sus trabajos audiovisuales cabe destacar su trabajo junto a José Luis Tirado, con el que ha colaborado en tres largometrajes documentales, así como su participación activa permanente en el colectivo audiovisual ZEMOS98. Hèctor Parra (Barcelona on 1976) has studied composition with Jonathan Harvey, Brian Ferneyhough as well as with Michael Jarrell in Geneva. He has the Master in Arts of the Paris-VIII University with honours. He has been Professor of Electroacoustic Composition at the Conservatory of Music of Zaragoza, in Spain, and actually he is composer in residence and professor of composition at Ircam-Centre Pompidou, in Paris. Premieres of his works have been performed by the Ensemble Intercontemporain, the Klangforum Wien, Ensembe Recherche, the Arditti Quartet, the Tokyo Philharmonic Orchestra, Brussels Philharmonic, Barcelona National Orchestra, etc. He received commissions from the French state, the Ircam-Centre Pompidou, the Berlin Academy of Arts, Münchener Biennale, the Strasbourg Festival, Musée du Louvre and the Selmer Society, among others. His are also performed at the international festivals of Lucerne, Avignon, Warsaw Autumn, Wien Modern, Donaueschinen, Agora-Ircam, Witten, Stuttgart Opera House, Bacelona Opera Liceu, Guggenheim NY, San Francisco Arts Festival, Vienna Konzerthaus... Winner of the Ernst von Siemens Composers Prize 2011, in 2007 he won the Donald Aird Memorial Prize of San Francisco. In 2005 he was unanimously awarded the Tremplin Prize given by the Ensemble Intercontemporain. In 2002 he won the Prize of the National Institute for Performing Arts and Music of Spain. His works are published by Durand (Universal Music Publishing Classical, Paris) and Editorial Tritó (Barcelona). A monographic CD with his trios and chamber music performed by the ensemble Recherche has been published by the label KAIROS (2008). In 2010 KAIROS publishes his chamber opera Hypermusic Prologue, with a libretto of the renowned Harvard physicist Lisa Randall, played by the Ensemble Intercontemporain and Ircam, and in 2012 Col-legno and the Ernst von Siemens Foundation publishes his third monographic CD: Caressant l’Horizon. Céler Gutiérrez was born in Madrid in 1988 where he began his musical training. He studied percussion in Majadahonda where he attended to classes of harmony and composition with Alberto Posadas. In 2007 he began his superior studies of Composition in the Music Conservatory of Aragón (CSMA) where he studied composition with José Manuel López López, José María Sánchez-Verdú and Agustín Charles, assisting to classes of electroacoustic music of Héctor Parra. He has attended to musical courses by Aureliano Cattaneo, Alberto Posadas, Lazkano and Cendo. He has also attended to master classes by Pierluigi Billone, Helmut Lachenmann, Salvatore Sciarrino, Bernhard Lang, Georges Aperghis, Stefano Gervasoni and Ivan Fedele. In 2012 he won the Second Prize of the Injuve Composition Competition for spanish young composers. He obtained in 2013 an Electroacoustic Postgraduate from the Katarina Gurska’s Conservatory, where he learned from Alberto Bernal and Sergio Luque. He is working actually in a electronic proyect The Axiom of Choice with Tomás Virgós, and co-managing Drama Ensemble. His work has been premiered in places such as Reina Sofía’s museum Auditory, the Spanish Music Festival of Cádiz, and the Juan March’s Foundation among others. He is currently composer in residence for Taller Sonoro. Manuel Delgado studied piano and composition in Seville and later in Granada, writing works for Traditional instruments: piano, choir, ensembles, orchestra... Very early he was interested in electroacoustics and began composing works for tape alone, tape and instruments, and real time processing. In the last years, he has premiered several works, all including electroacoustics as a main element. He taught Electroacoustics and Computer Music at Seville's Superior Conservatory of Music (in addition to Counterpoint and Musical Analysis, among other subjects), and nowadays teaches Composition and Acoustics at "Cristóbal de Morales" Professional Conservatory in Seville. Isandro Ojeda-García was born in 1989 (Seville, Spain). He started learning music with his mother at six, then entered the Conservatorio Profesional de Música Francisco Guerrero where he studied the saxophone with Miguel Romero and Alfonso Romero. With the latter, he was also initiated to composition, which he currently studies at the Haute École de Musique of Geneva with Michael Jarrell, Luis Naón and Eric Daubresse, since 2013. He has attended workshops and seminars by Martín Matalón, Tom Mays, Alberto Bernal, Philippe Hurel and Ivan Fedele. In 2010 he won the first prize and a special prize for students in "I Premio de composición, Expontaneidad Dirigida, Cimucc 2010". In 2012 he was selected for the artist residency organized by the MOVIC program. In 2014 he was selected for the Cátredra Manuel de Falla, supported by the andalusian government. He is a founding member of the Zel Art Project collective based in Geneva, which brings together many young artists from different disciplines. Since its creation in 2000, Taller Sonoro has tirelessly advanced in two main directions, the interpretation of the latest and most radical music in its aesthetic proposal, with the aim of offering it to the Spanish and international public with the highest degree of rigor and commitment; and support for young composers, offering the group itself as a useful and professional tool to fully develop their creative bet. The deployment of these two lines of action has been unstoppable in the last decade as it has been proven in a regular way in the Ciclo de Música Contemporanea in Seville and Granada from 2002, in seasons of CDMC at the Museo Reina Sofia Art Center, 2006, 2007 (and soon 2012), in the Ciclo de Música Comtemporanea in Córdoba (2005), the Ciclo de Música Contemporanea Orquesta Sinfónica of Malaga (2007), the Festival de Música Contemporanea of Alicante (2008), the Quincena Musical of San Sebastian (2006) and festivals KLEM (Bilbao, 2009) and ENSEMS (Valencia, 2010) … landmarks of an Iberian Peninsula which also lists the names of Almería (Ciclo de Música de Cámara of Unicaja), Santander (Universidad Internacional Menendez Pelayo), Murcia (II Festival de Música Contemporanea in Molina de Segura) and, again, Madrid (Auditorio Nacional de Musica). Simultaneously, the international diffusion of the activity of Taller Sonoro has been one of its prime objectives, contributing to the knowledge of current Spanish repertoires in European scope- Cycle OPUS 5.1 (Bordeaux, 2005), Cycle “Spirals” ( Paris, 2005), Hochschule für Musik (Frankfurt am Main, 2005), Instituto Cervantes Berlin (2006, 2007) and Bremen (2007), Colegio de España and Instituto Cervantes de Paris (2007), Theatre Quartz (Brest, 2008) Academia de España in Rome (2010) and recently in the Vienna Musikverein (May 2011) and, singularly, it is a group of remarkable presence in Latin American latitudes, from Peru (Festival de Música Contemporanea in Lima, 2007 and 2008) to Mexico (Festival Múisca contemporanea in Morelia, 2010) and Argentina (2011). Certainly, the collaboration with other musical groups and access to the recording market decisively enriches the contribution of Taller Sonoro to the national scene: with several projects in which the group has collaborated with the Ensemble Organum Marcel Peres and the Ensemble Gilles Binchois conducted by Dominique Vellard, the phonographic presence of our group covers monographs devoted to composers such as José María Sánchez-Verdú, Juan Cruz and Cesar Camarero, within the first edited series by Anemos in 2009 – as well as two live recordings devoted to the work of David del Puerto (Sendesaal, Radio Bremen, 28/11/2007) and finalists composers Premio Fundación de Autor SGAE (Auditorio 400, National Museum Art Centre Reina Sofia, 12.03.2007). Moreover, the pedagogical work of Taller Sonoro and its collaboration with the promotions of younger composers has been a fundamental constant in its career: thus in 2005 at the Hochschule für Musik in Frankfurt am Main and between 2004 and 2006 as resident group in the Curso Internacional de Analisis y Composición de Villafranca del Bierzo ( International Course on Analysis and Composition ), led by Cristóbal Halffter, and, in very significant way , the group is a fundamental part of the activities of the Chair of Composition “Manuel de Falla” in Cádiz promoted by Junta de Andalucía since 2004, which has become Taller Sonoro into a regular group in the planning of Festival de Música Española which is held annually in the Andalusian city. As evidence of this interest in direct and intimate contact with the composers at an early stage of professionalization, Taller Sonoro has undertaken several projects in recent years, currently valid thus, in 2008 established the position of “Resident Composer “, annually renewed and has already gone to Joav Pasowsky, Victor Ibarra and Christian Morales, and that in the same year the organization started an annual course, the “Taller Instrumental de Múisca Actual” (TIMAC), aimed at conservatory students and teachers in order to familiarize them with the current repertoire. Finally, Taller Sonoro, which since 2008 is managed from the promotional, administrative and artistic point of view by the company Ensemble Sonoro S. L. – has not forgotten the research, analysis and theoretical thoughts on the contemporary music: with more than twenty thousand visitors annually, the online magazine Espacio Sonoro, included since 2004 in the band’s website (www.tallersonoro.com) which is held every four months, it has become an essential reference for music lovers and for professionals who are interested in the sonic adventure of our time. Plural lines thrown into the future: in recent months, one of the initiatives received with greater expectations has been the creation of the Laboratorio de Música Electrónica de Andalucia Taller Sonoro (Laboratory of Electronic Music) (LEMAts), with the intention of making it an essential tool in our country for the composition of electronic music, both acousmatic and mixed, opened , like the instrumental group, to young composers. This is not, obviously, the only ajar door: We are aware of the necessity for opening horizons of repertoire, Taller Sonoro expects, in shortly, to make its staff more flexible; based on the initial organic-seven instrumentalists, held since its foundation- for specific projects in which the group will count on outside conductors ad hoc and visual artists who complete comprehensive proposals, so seductive in sound,spatial and visual fields, with the decisive addition of the fruits of LEMAts. These are our proposals and our renewed hope, based in a reality which is more than a decade behind but we only consider as the necessary impulse for further and more profound accomplishments.